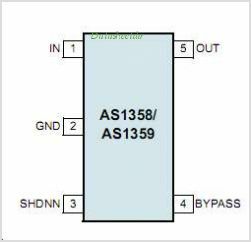 The AS1358 AS1359 are ultra-low-noise, low-dropout linear Regulators specifically designed to deliver up to 150/300mA continuous output current, and CAN achieve a low 140mV dropout for 300mA load current. The LDOs are designed and optimized to work with low-cost, small-capacitance ceramic capacitors. This is one package pinout of AS1358,If you need more pinouts please download AS1358's pdf datasheet. 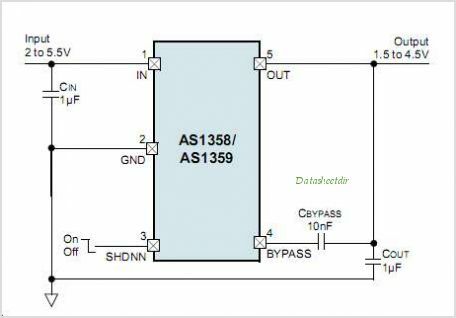 This is one application circuit of AS1358,If you need more circuits,please download AS1358's pdf datasheet.